This item has been discontinued. Please choose from our other Gerber Tools. 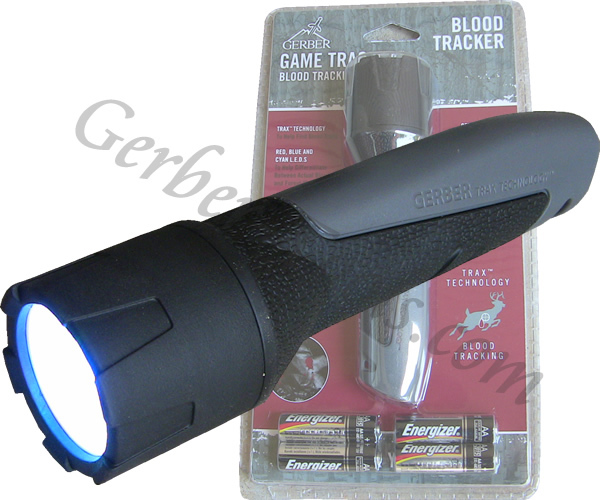 Make sure not to lose another one with this Gerber Game Tracker blood tracking Flashlight, model 31-000304. The Game Tracker uses red, blue, and cyan LED lights to help the human eye distinguish between blood and natural forest colors. The blood shows up as a bright red color under this light. This flashlight is designed for comfort with the integrated Gerber Gator-Grip handle, which gives good grip even in wet conditions. The Gerber Game Tracker uses 4 AA batteries and operates great ideally at 6ft from the target.